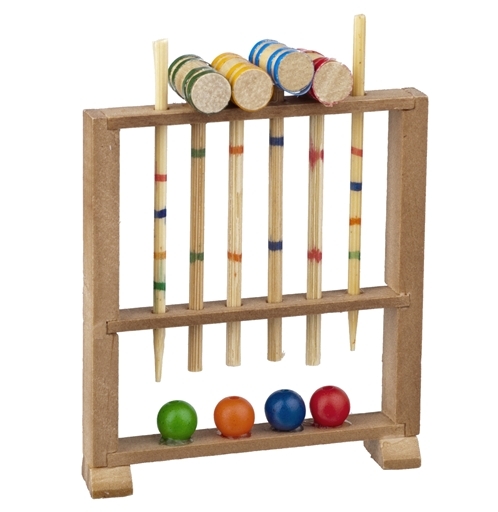 This croquet set includes a wooden stand with wooden mallets, posts, and colorful balls. Items are not removable from stand. May vary slightly. Click here to see this product in use. This set is so cute. We made the wire hoops to go with them, and placed them in our yard seen. Love them. Cute set, I was kind of disappointed that it didn't have a few of the wire things that you hit the ball through. Other than that, a very nice set. I love the Croquet Set. It looks just like Grandma's set. It takes me back. It is very nice.